It's week 5 of the Learn Like A Pirate book study...and I have been so excited to share my thoughts on this chapter! Let's just get right to it, shall we? And-of course-how will this impact the student-led classroom? 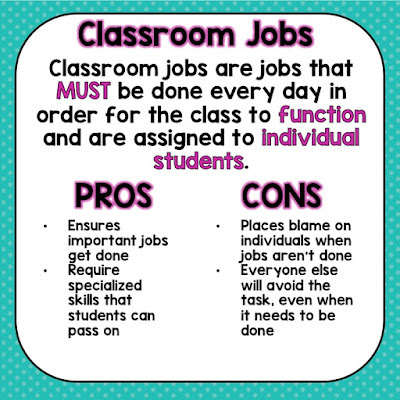 The first thing to point out is that Solarz has two categories for student responsibilities: classroom jobs and collaborative responsibilities. So what do you consider important jobs that must be done daily? I immediately thought of someone to dump the pencil sharpener. That thing drove me nuts this year. They would wait until it wouldn't sharpen anymore, and then they would insist it was broken. Oiy. And a mail person-if I waited until I had time to do it, it would never get done. Solarz did mention these jobs, plus several more like an announcer, morning greeter, and an evaluator. 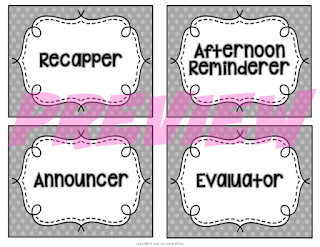 The evaluator is my favorite since it allows students to reflect on their day and set a goal for the next day. That one will definitely be in my room this year. But let's not forget about everything else that still needs to get done (like stacked chairs). 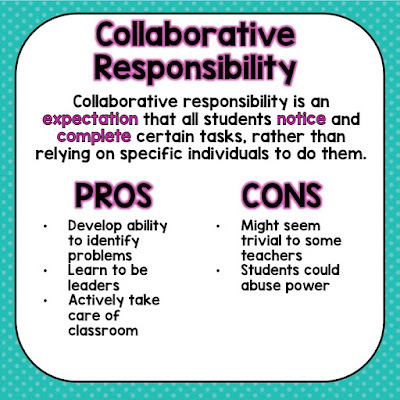 This is where collaborative responsibility comes in. 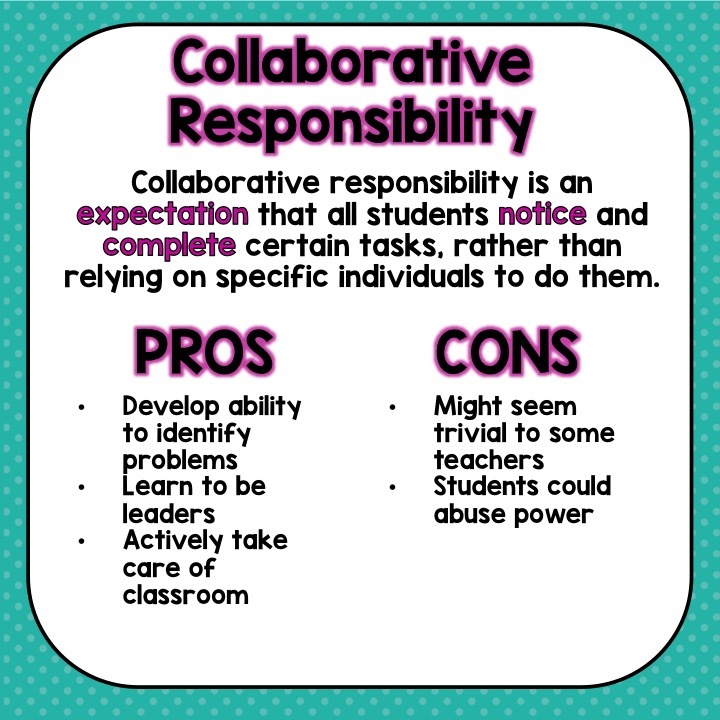 Now, let me point out that in order for our students to recognize these collaborative responsibilities, we need to first identify them and give our students the opportunity to actually do them. This could include transitions between subjects, getting materials, answering the phone, and stacking chairs. But what happens when they neglect these responsibilities? Well, Solarz suggests a couple of things. You could do it for them, and then tell them you expect them to take responsibility for it in the future. You could ask a specific student to do it, then let them know someone else will do it the next time. If it still doesn't stick, you could make it a permanent job or simply allow natural consequences (like missing recess or being late to specials) to occur. The chapter goes on to discuss the difference between routines and rituals, which I won't delve into, but you should definitely check out. To be honest, I never realized the difference until I read this chapter. Also, I was really intrigued by Solarz' end-of-day ritual. This is where that evaluator job becomes so important. Definitely check it out! 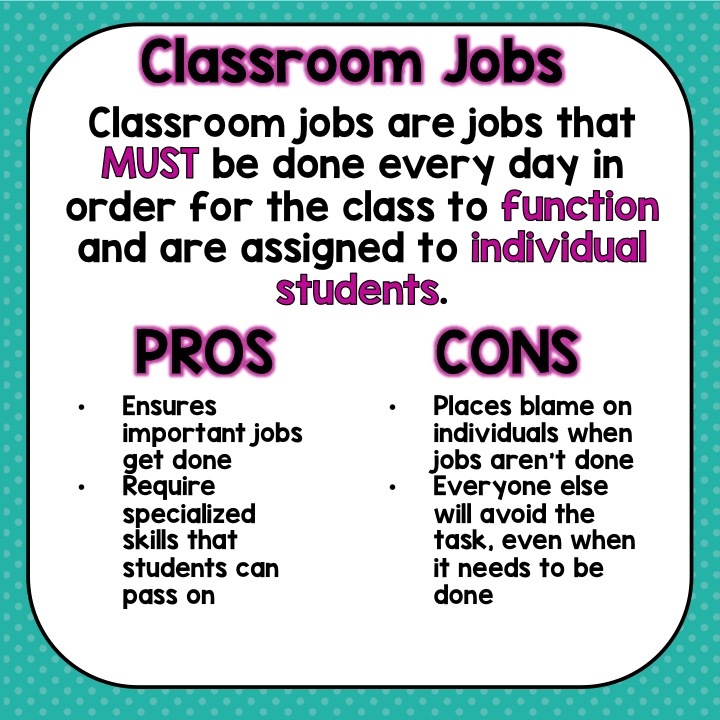 But, before I head out, I wanted to share the job cards I made for my class this year. They are pulled from the book, and I cannot wait to use them. You can click HERE or on the pictures below to download them for free. 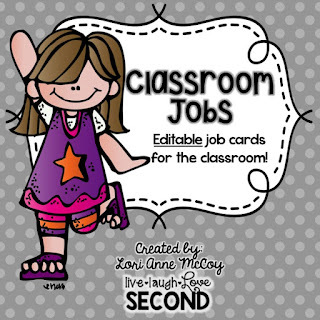 There is even a separate file with editable cards to add more jobs for your room. I hope you all have a happy holiday weekend! And don't forget to check out some other thoughts on this chapter.